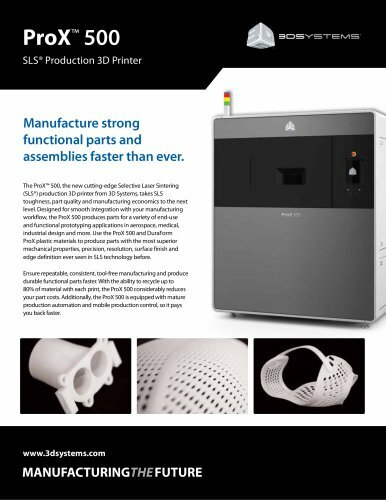 ProX™ 500 SLS® Production 3D Printer Manufacture strong functional parts and assemblies faster than ever. The ProX™ 500, the new cutting-edge Selective Laser Sintering (SLS®) production 3D printer from 3D Systems, takes SLS toughness, part quality and manufacturing economics to the next level. Designed for smooth integration with your manufacturing workflow, the ProX 500 produces parts for a variety of end-use and functional prototyping applications in aerospace, medical, industrial design and more. Use the ProX 500 and DuraForm ProX plastic materials to produce parts with the most superior mechanical properties, precision, resolution, surface finish and edge definition ever seen in SLS technology before. Ensure repeatable, consistent, tool-free manufacturing and produce durable functional parts faster. With the ability to recycle up to 80% of material with each print, the ProX 500 considerably reduces your part costs. Additionally, the ProX 500 is equipped with mature production automation and mobile production control, so it pays you back faster.